Enjoy the solitude of spacious, pristine, white sand beaches along with spectacular views of the emerald green waters of the Gulf of Mexico. Our unique, one bedroom, floor plan with bunks in the hall will sleep four to six comfortably. This Non-Smoking unit in the Gulf Dunes Condominium Complex is tastefully decorated. It is located on the second floor (actually the 3rd level of the complex) and features ceramic tile flooring, a king bed in the master, built-in hall bunks, and a queen sleeper sofa. Magnificent unobstructed view of the ocean from our balcony. We have a DVD player and high speed internet access. A washer and dryer are also in the unit. The interior of our condo was recently painted. Also, new counter tops and cabinetry were just installed. Special property amenities include: 426 feet of Gulf Front paradise, lush tropical landscaping, private dune walk-over with shower, two seasonally gulf-front heated pools and tennis courts. Beach service is also included with every rental between March 1 and October 31 (2 chairs and 1 umbrella). Okaloosa Island is conveniently located two miles from Fort Walton, six miles from Destin, and one mile from the new Convention Center. Great vacation stay, as usual! 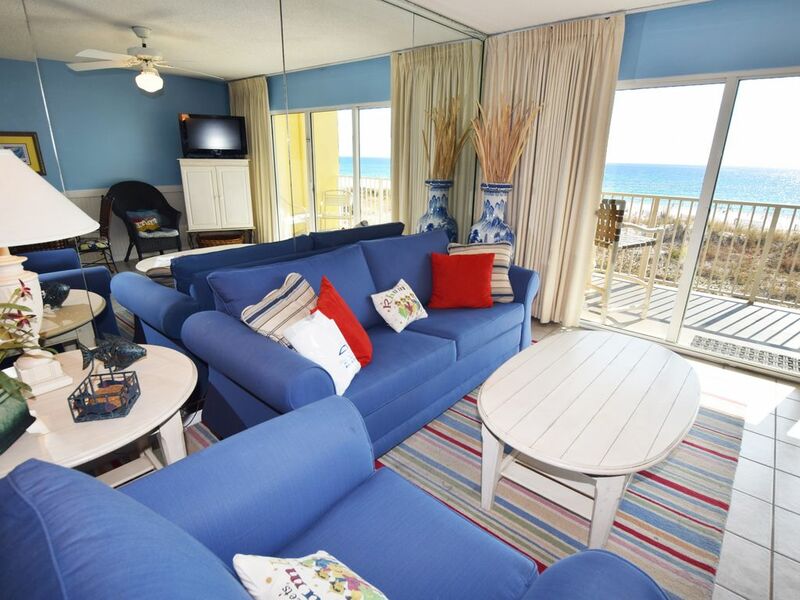 This is our second vacation staying in unit 206 at Gulf Dunes. We enjoy the laid-back atmosphere of the area, and feel so comfortable in the condo. Everything is provided for our stay - all kitchen items, bath/laundry, anything we needed was there. The unit was perfectly clean upon arrival. We feel at home when we stay. I do want to commend the people at the other end of the "help line"; I had attempted to change the door code to a more personal one (with instructions clearly written on how to do this being provided), got it all messed up. Made a phone call to the number provided in our welcome packet, and she was able to immediately reset the code. We highly recommend this unit, and we will certainly return for a third stay. Condo was very nice and in a good location. Beach chairs and umbrellas put up every morning and not crowded together. Unfortunately the shower and hose on walkway was not working so the pool was being used to wash off sand and seaweed but this was no fault of the condo owner. The elevator was never a long wait. The condo is stocked well as described but no coffee filters for our first morning left by previous renter. We left extras. The king sized bed is very comfortable. Couch and chair were both comfortable. Wifi worked great as well as TV's. We will miss our breakfasts on the balcony seeing dolphins in the beautiful water. We would definitely recommend staying here. Beautiful view! The beach was like sugar and water was amazing. Clean and had everthing we needed. Having an umbrella and chairs for the beach was a great amenity. Thanks for sharing your beautiful space!! Nice condo but needed some cleaning, The area rug in living area had several dirty spots on it and the bathroom wall and shower curtain had some mildew on one area. Otherwise it was okay. We had a great time loved the view from room. Bigger than we thought. Having the beach service included was a definite plus. The clock on the wall at first annoyed us because it didn't work then we realized it was set on 5:00 s in 5 a clock somewhere lol! Very clean the things like linens etc were ample. The only negative was the balcony floor was sticky and left our feet and socks dirty. We are hopeful to stay there again next year. We thank you for the great time we celebrated our 40th anniversary and were sad to leave!!! Our family enjoyed our stay,the unit was nice! The view was beautiful!! Fees and taxes apply to all rates. Please choose dates and detail pricing options on this page to see total prices.